Home » Beauty and Skin Care » Dry Brushing For Skin? Its Benefits And How To Use It! Dry brushing comes with a horde of benefits that explains its popularity among the masses. 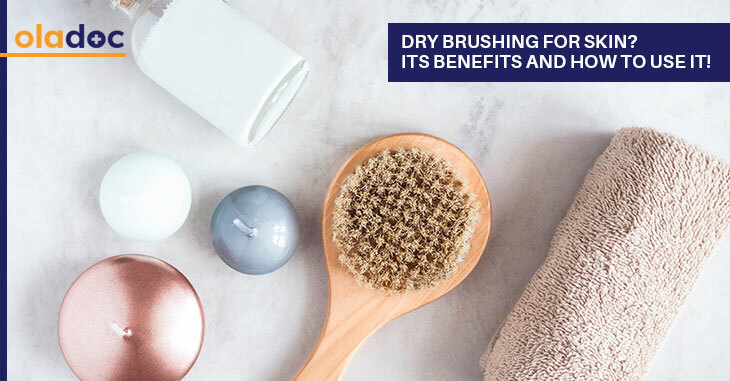 From exfoliating the skin, to helping detox, dry brushing is an invaluable practice that can help prevent so many issues. Dry brushing can be easily done at home and can fit into a hectic schedule without any difficulty. The bristles of the bush help sweep away the dead skin cells that accumulate on the surface of skin and make the skin look dry. Even the best body scrubs and loofahs cannot beat dry brushing when it comes to exfoliation. Proper and frequent exfoliation will stimulate healthy skin cells to come to the surface and take away the dull look of the skin. Lymph flows in the lymphatic vessels just beneath the surface of skin. Dry brushing stimulates these lymphatic vessels so the flow is regularized and the body detoxifies itself naturally. Cellulite is toxic material that accumulates in the fat cells of the body due to poor circulation, lack of collagen and loose skin. Their elimination is difficult but dry brushing is a good technique that helps break down the toxins and eliminate them. It does so by breaking the fatty deposits, improving circulation and tightening the skin thus giving less space for cellulite to form. Dry brushing also helps clean the pores in the skin and get rid of sebum and oil. This is extremely beneficial for oily and acne-prone skin. If nothing is helping clear your skin, then give dry brushing a try. Be sure to use a brush with softer bristles to protect the delicate skin of the face. If done right, dry brushing can also help boost energy. For this reason, it is a good activity to do in the morning. Technique and the type of dry brush you use play an important role in dry brushing. Invest in a natural bristle brush with a long handle, to effectively reach all areas of the body. Start brushing from the feet, in long sweeping motions towards the heart. Overlap areas as you go and brush several times. As you brush more frequently, you will notice a decrease in skin sensitivity. Be gentle, but be firm. After brushing the entire body, take a shower, followed by application of your preferred moisturizer or body oil. You can brush your body once or twice a day for optimal results. Be sure to thoroughly clean your brush weekly. Dry brushing is great for your skin, and your overall well being. However, do take professional advice in consideration when applying new techniques on the skin. Book an appointment with top dermatologist in Lahore, Karachi and Islamabad through oladoc.com, or call our helpline at 042-3890-0939 for assistance to find the RIGHT professional for your concerns.